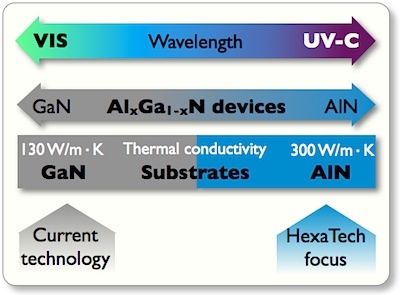 Aluminum nitride (AlN) offers many enabling improvements over existing SiC- and GaN-based semiconductor technologies given its unique electrical and physical properties. For ultraviolet optoelectronic, high power and high frequency devices, AlN provides an isostructural, native template for subsequent (Al,In,Ga)N epitaxial growth. This leads to increased device performance and reliability through pseudomorphic growth of low defect density device layers. For optoelectronic and power conversion applications, AlN’s ultra-wide bandgap provides several distinct advantages. 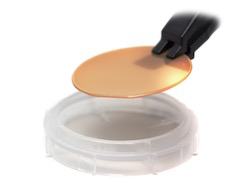 In optoelectronics, AlN substrates enable growth of high-quality, Al-rich AlGaN device structures which are nearly transparent in the UV-C spectral range. For power conversion and RF devices, it allows for higher-power, higher-frequency and higher power density operation. AlN’s ultra-wide bandgap also yields far lower intrinsic carrier concentrations at elevated temperatures, which, along with its superior thermal conductivity, reduces leakage current and simplifies heat extraction schemes. AlN also possesses the highest critical field strength, nearly 15 MV/cm, of any known semiconductor material. For high power devices, this simultaneously allows for both higher blocking voltages and higher efficiencies than devices based on either SiC or GaN. HexaTech produces the world’s highest crystal quality single crystalline AlN substrates, with an average dislocation density of 102 - 104 cm-2, which provide the basis to grow epitaxial films of similar quality. This represents up to a six order of magnitude improvement in dislocation density when compared to epitaxial layers grown on competing technologies.